The base model includes clear glass. 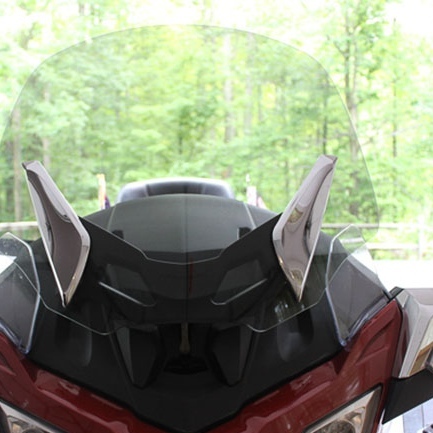 Choosing the perfect height for your motorcycle windshield can be challenging. Here are a few important things to keep in mind: do you want to look over the windshield or will you be comfortable looking through the windshield, what do you like about the performance of the stock windscreen and what don’t you like, and where and when do you ride? Sport: The sport windscreen is three inches shorter than the stock. It gives your motorcycle a sporty look, with all the added benefits of an F4 Customs motorcycle windshield. Stock: The stock height is just that, the same height as the stock windshield. But with the F4 Customs stock height windshield you get all the benefits of an F4 like: optical clarity, scratch resistance, rain-shedding and easy cleaning. +3: The Plus 3 is standing tall at 28” from the bottom of the windscreen to the top. It is three inches taller and all Plus 3 models are made 2 and 1/2 wider per side than the stock. 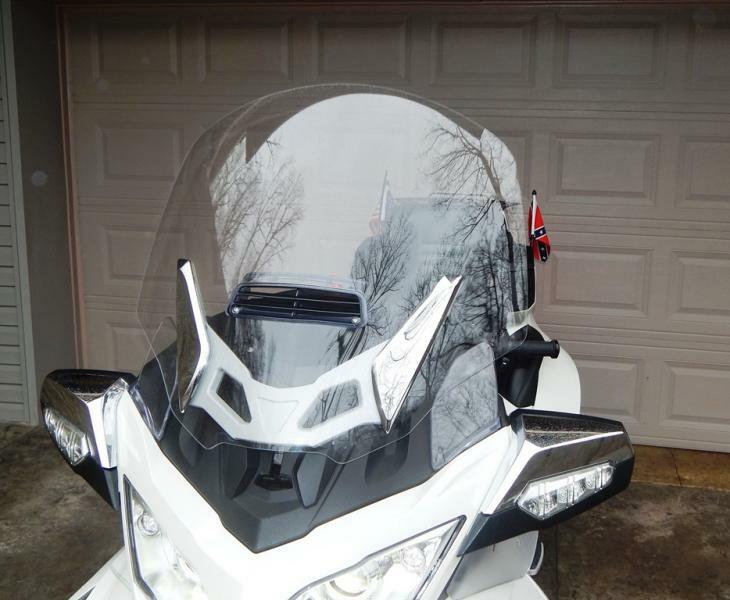 This windshield provides maximum wind protection for you and a co-rider. Should I get a vent? We use a 5-position tinted vent in our windshields. The vent gives you the control over how much wind reaches you. The vent works great in all windshield models however, can be especially beneficial in the taller, wider models that aim to reduce the amount of wind you feel. Measure your windshield from the bottom of the windshield to the top in the center. You will need to measure the windshield from the front of the motorcycle. This will give you the measurement needed to compare what heights will work best for you. Please note the stock windshield is 25” from the bottom to the top. Before shutting down engine, raise windshield to highest point. Remove T-25 Torx bolts from back side of windshield bracket. These are the fasteners that hold the windshield trim pieces on. Place bolts on seat with T-25 Torx tool. Remove trim pieces by slightly pulling top of trim out from windshield and moving trim piece downward. This will release the trim piece from the windshield. Lay on seat, left and right side noted. TIP: Place a playing card (or something similar) between the bottom point of the trim piece and the windshield. This will prevent the tip of the trim piece from gouging the windshield when the trim piece is removed. Remove T-30 Torx mounting bolts (a second set of hands will be very useful) and remove windshield. Lay windshield on large flat surface. You will see metal spacers inside the rubber mounting grommets. Remove these by pushing out of grommet with a round object (a #3 Phillips screwdriver is perfect for the job). Carefully remove the rubber mounting grommets from the shield by slowly working them out of the holes in the shield. Lay new shield on large flat surface. Slowly work rubber grommets into mounting holes in new windshield. Be patient, these can be challenging at times. Once the rubber grommet is in place, push the metal spacer into the rubber grommet. Once you have completed all four, you are ready for your helper again. IF YOU HAVE HANDLED THE SHIELD AND HAVE FINGERPRINTS ON IT, BE SURE TO CLEAN THE AREA THAT WILL BE BEHIND THE MOUNTING BRACKET. Step 6: Hold the new shield up to the mounting bracket, moving slowly in order that the new shield (the glass itself) does not contact the metal bracket. Align the mounting holes and install the mounting bolts using care not to cross thread the bolts. Tighten snugly but do not over tighten. Replace the trim pieces by placing L-shaped (don’t forget the playing card) tab into bottom square hole in shield. Use gentle pressure to push in toward windshield and UP so tab locks onto shield. Square boss at top of trim piece should fall into place in square top hole. Install T-25 bolts to fasten trim piece. Thank you for your F4 Customs windshield purchase. If you have any difficulties regarding the replacement process, please feel free to contact us. ***F4 Customs is not responsible for any injury or harm to either the individual or product resulting from the installation process.